June 27, 2018 (New York, NY) – The US retail industry will continue to dominate the digital ad business this year. Retailers will spend $23.50 billion on digital ads, up 18.7% over last year, representing nearly 22% of US digital ad spending. The sector’s investment in mobile ads will total $16.33 billion, up 23.6% over 2017, accounting for nearly 70% of retailers’ digital ad spending. That gives the retail industry a nearly 22% share of US mobile ad spending. The auto industry will remain the second-highest digital ad spender in the US. Auto marketers will spend $13.57 billion on digital ads in 2018, up 16.9% over last year. The automotive sector will command 12.6% of all US mobile ad spending, or $9.42 billion. 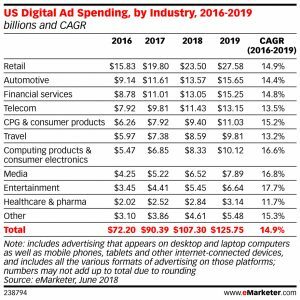 Overall, US digital ad spending will grow 18.7% this year to reach $107.30 billion. “Other” includes categories outside of those mentioned above, such as real estate, education, government, business and industrial, elections, energy and petrochemical, annual events, etc.